Code for this article can be downloaded from here. At the end of this article you should be able to customize the ribbon. We will add a tab named “My Zone” containing two groups, “My links” and “My Contacts” containing your web site links and email addresses of your contacts. When you click on any of the “links” in the “My Links” group, that link will get added to the document at the current position of the cursor. a) The schema for ribbon XML which can be downloaded from here. b) Custom UI Editor which allows you to add a custom UI part to a document. This can be downloaded from here. 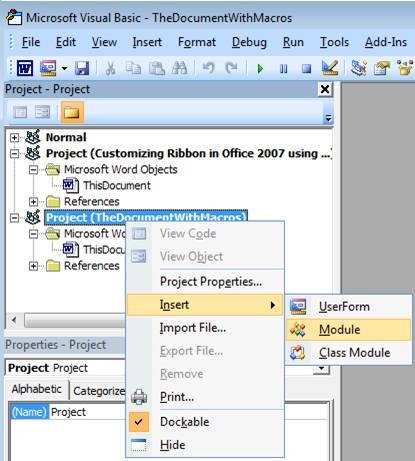 For the purpose of the example in this document we will have a Ribbon XML created already and we would put the same into an existing word document on run-time. 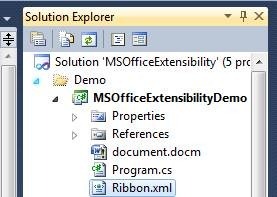 Line 6:- Reads the contents of the document.docm file and pass the binary content to the AddRibbonToDocument() method which will add the ribbon to the document. Line 7-14:- The binary content of the file (which also contains the ribbon now) is written to the same file as original and opened. Add the below method in Program.cs. This method takes the binary content of a word file and adds the Ribbon XML to it. Line 4-8 :- The binary content of the document is put in a MemoryStream which will be used for any modification in the content. Line 9 :– The ribbon XML is got from the GetRibbonXML() method which can either get the XML from a static file or dynamically construct from the database values. Line 10 :- WordProcessingDocument object is initialized from the memorysteam of the document content. The second parameter of the constructor is “IsEditable” is set to true as we are going to modify its content. Line 14- 15 :- Get the main document part from the wordprocessing document and delete any existing custom ribbon from it. 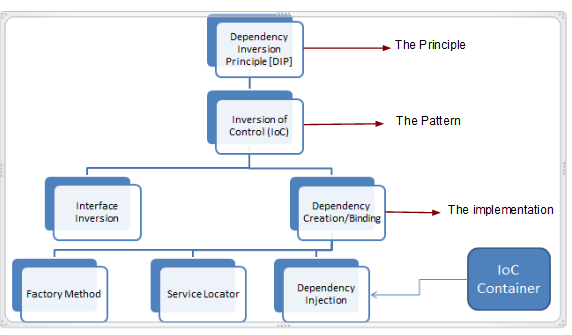 Line 17 – 19 :- Content of the ribbon XML needs to be added as a RibbonExtensibilityPart to the main document and a relationship will be created for the same. Infact any type of content you add to a document as a part, you must create its (part’s) relationship with the document so that document can load up that part when you open the document in MSWord (or in general MS Office). So, at this point of time If you run the application, the document.docm should get opened and you should see the tab and the buttons. Look at the _rels/.rels file. You don’t see anything related to Custom UI here. Look at the _rels/.rels file. 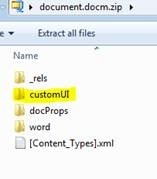 You will see a new entry stating the relationship with the CustomUI.xml file here. btw, If you click on any of the buttons now, nothing would happen as we haven’t added any interactivity features to those buttons. 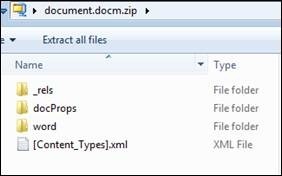 1) Make a copy of the Document.docm and rename the copied document to “DocumentWithMacros.docm”. Open the developer tab and insert a “Module” to the project. ActiveDocument.Hyperlinks.Add Anchor:=Selection.Range, address:="" & address & "", SubAddress:="", textTodisplay:="" & textTodisplay & ""
4) At this point of time if you view the TheDocumentWithMacros.docm, you see vbaProject.bin. This file has got the binary form of all the macros the document contains. This is what we need to copy in our main document (document.docm). 5) Now we have the macros in “TheDocumentWithMacro.docm”. Its time to call them from our main document “Document.docm”.We call those macro functions from the onAction event of the button. Line 11- 18 :- Get the VbaProjectPart from the document with macro. Line 20-29 :- Get the VbaProjectPart from the document. Line 31-32 :- Delete the existing VbaProjectPart from the document If any. 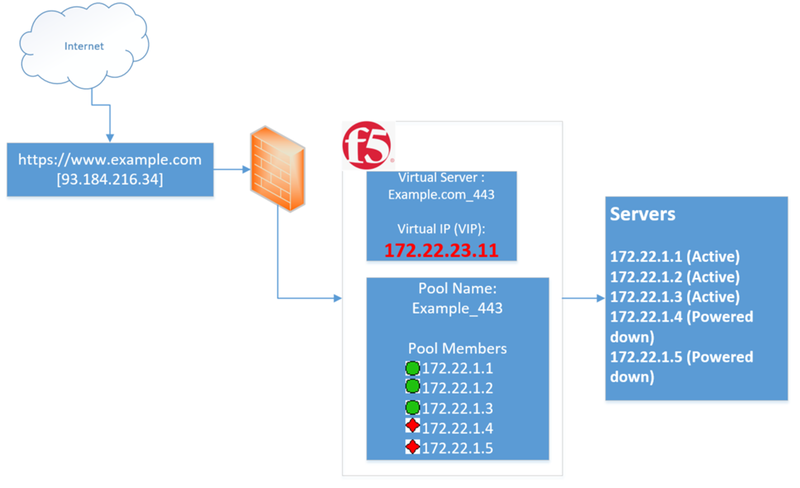 Line 34-35 :- Add the VbaProjectPart got from the Line (125-133) to the document. 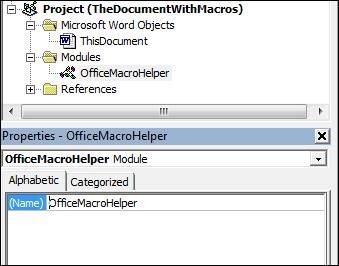 7) Get the binary content of the “TheDocumentWithMacro.docm” (line 7). 8) Modify the AddRibbonToDocument() to add call to CopyMacro() method (line 20). At this point of time, If you run the application you should see the buttons on the newly added tab. Clicking on the buttons embed links on the document. 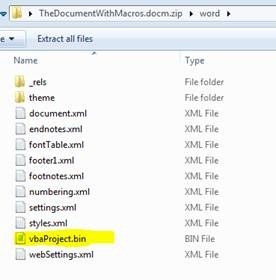 NOTE :- If you are like me, you must be thinking of creating the VBProject dynamically to the document.docm file rather than maintaining another file (ThedocumentWithMacro.docm) and copying from the same. Although theoretically Its possible, Its way too complex to implement or I just dont have the time to implement that way. See this msdn.microsoft.com/en-us/library/cc313094(v=office.12).aspx. This entry was posted on January 11, 2011, 5:33 pm and is filed under Office Development. You can follow any responses to this entry through RSS 2.0. You can leave a response, or trackback from your own site. Adding custom pane to the ribbon in Microsoft Word 2007 using OpenXML SDK 2.0 and VBA « Working hard leads to working smart.